Every year, automakers introduce new lines. Sometimes the differences in models are minor, but every few years the cars are totally reimagined with all the latest bells and whistles. Janitorial equipment manufacturers also release souped-up versions of their machines on a regular basis. With new products frequently flooding the crowded marketplace, buyers can feel overwhelmed. 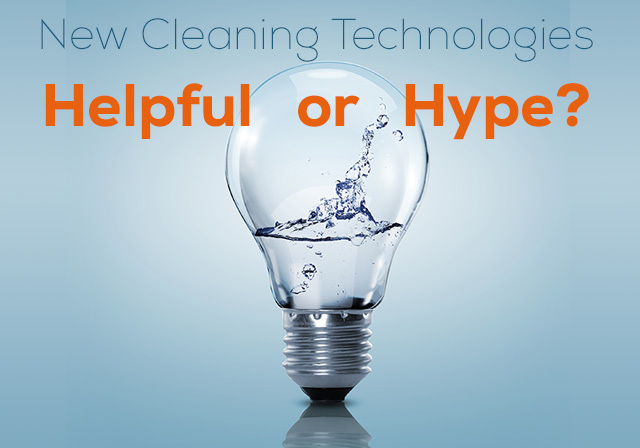 Which of the latest and greatest technology features are truly helpful and which are just hype? In recent years, floor-care equipment has been upgraded with technology that promises to make cleaning more effective, efficient, or environmentally friendly. Lightweight and long-lasting lithium-ion batteries that reduce labor costs. Onboard recycling systems that conserve water and limit waste. Intuitive touchscreen control panels that reduce training and errors. Oxygenated water that reduces or eliminates chemical usage. Wifi-enabled reporting that allows a manager to track a machine’s usage and maintenance to boost productivity. So when is the right time to level up fancy new features? Marketing Manager for Tornado Industries. Tornado uses this same three-pronged evaluation process to determine which technologies should be added to the equipment it manufactures. 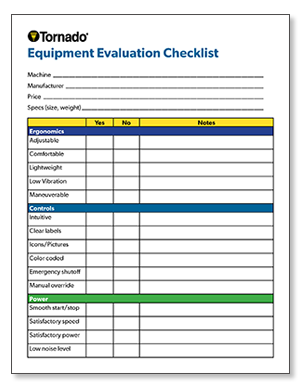 Make sure your next equipment purchase is a smart one by downloading our free “Equipment Evaluation” checklist. Batteries are a perfect example of technology that meets the needs-vs.-budget criteria. When certain types of smaller battery-operated floor-care machines were first introduced, they were expensive, heavy, and often fell short on power and run times. The need was there, but the technology fell short both on features and price point. When it comes to equipment shopping, Martschinke says, it’s less “buyer beware” and more “buyer be prepared.” Be clear about your needs and which features address them, and set a spending cap. Then, simply don’t buy a machine until it fits all parameters.